DELTA DUST containing deltamethrin is the world's first and only 100% waterproof insecticide dust, so it works in the wet and damp places that insects love. Nothing short of running water will disturb it, making Delta Dust an ideal crack and crevice treatment. Delta Dust should be applied with a bellows hand duster (sold seperately) which allows you to easily apply the dust in hard to reach areas. One application of Delta Dust will keep on killing insects for up to eight months. 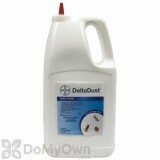 Delta Dust should not be the only product used in the fight against bed bugs as it does not kill quick enough. For best results, use a contact kill such as Sterifab or Bedlam in addition to Delta Dust. Not for Sale in NY. 1 lb. Covers 1,000 sq. ft.
DeltaDust containing deltamethrin is the world's first and only 100% waterproof insecticide dust, so it works in the wet and damp places that insects love. Nothing short of running water will disturb Delta Dust, making Delta Dust an ideal crack and crevice treatment. Delta Dust should be applied with a bellows hand duster (sold seperately) which allows you to easily apply the dust in hard to reach areas. One application of Delta Dust will keep on killing insects for up to eight months. 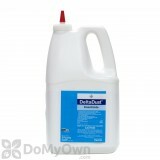 DeltaDust is intended for application with a hand or power duster (Actisol DPA or similar equipment), with a paint brush or by other suitable means, for hiding and runaway areas and other places where insects are found. In living areas, apply in such a manner as to avoid depositions on exposed surfaces or introducing the material into the air. In the home, all food processing surfaces and utensils should be covered during treatment or thoroughly washed before use. Exposed food should be covered or removed. To apply insecticide directly into cracks and crevices, use a bulbous duster or other suitable equipment. Apply lightly and uniformly to infested area. Pay particular attention to: cracks and crevices, service ducts, floors and ceilings, wall voids, around electrical and telephone fittings and equipment, around water and sewer pipes, under and behind cabinets, refrigerators and sinks, around windows and door frames, along baseboards, in attics and crawl spaces. The amount to be applied will vary with the site but should usually be in the range of 2-3 grams of DeltaDust per square yard (or 0.5 lbs per 1000 square feet). When applying, the duster should be filled only halfway - no more than two-thirds full. This allows for adequate air space to create the desired air/dust mixture prior to application. If there is too much dust in the duster, clumps of dust on treated surfaces may result, leading to overapplication of the product and messy spills. Between each squeeze, the duster should be shaken slightly to get dust floating inside the unit. When applying dust into cracks and crevices and on surfaces, gently squeeze the duster to ensure the application of very thin layers of dust. When dusting correctly, you should barely be able to see the dust emerging from the tip of the duster. Before relaxing your grip on the duster, pull it away from the surface or crack you are treating to prevent sucking up lint, moisture or debris. Small amounts of these items will eventually cause lumping and/or clogging of the duster. Place several pebbles or small ball bearings in your duster to keep the dust agitated and ensure than any clumps are broken up prior to application. Also, always keep the screen inside the duster in place as this is designed to help maintain a fine dust consistency. When treating around electrical outlets, use dusters fitted with plastic or fiberglass spouts, or place a small section of rubber hose or plastic tubing over the metal tip to avoid contacting electrical wires. These tubes will also enable you to reach around corners and beneath cabinet voids that would otherwise be impossible to treat. Carry a small brush and a damp cloth. These can be used in the event that dust accidentally drifts out of cracks and crevices and onto non-target areas. Use the brush to push excess dust into cracks, and use the cloth to wipe up. Apply dust carefully and judiciously so it does not travel to areas where it might represent a hazard. Prevent food contamination by not applying dust to where it could filter down onto food or food areas after it is applied. Also, be aware of any air currents that could transfer dust to containers or other objects, leading to food contamination. If the applicator is to apply any kind of dust for extended periods of time, he or she should wear a respirator approved by the National Institute of Occupational Safety and Health (NIOSH). When using high-volume or high-pressure equipment to apply dust in attics or sub-floor crawl spaces, wear a NIOSH-approved respirator. Also, shut off fans, air conditioners, and hot-air heating equipment if necessary. If the dust is combustible, put out all flames and pilot lights, and shut down all spark-producing equipment in the treated area to avoid explosions. In general, do not place the tip of the duster in a moist location or allow the duster to sit in moist environments as it will absorb water and become clogged. Clogged dusters can be cleaned by scraping out the spout with a piece of stiff wire. Always follow the label when using DeltaDust. The siding on my home is red cedar and apparently it is a favorite treat for CARPENTER BEES. They were making terrible holes in the siding like perfectly round bullet holes, and then the woodpeckers would come along and peck at the wood making long channels so they could reach the carpenter bees behind the wood. It was a mess. My painters filled the wood with BONDO and caulk and wood filler...but that did not stop the bees. Over night they bored right through ALL of the products and the fresh paint. I called three exterminators but everyone told me they would spray and I would have to pay again and again in a few months because you could not kill them with just one spray. I BEG TO DIFFER! I found Delta Dust and I puffed it into the fresh new active holes that the bees made after painting. Within 24 hours I picked up over thirty dead bees on the ground around my house (I have small dogs and I did not want them eating dead poisoned bees). By 48 hours the count had risen to over SIXTY dead bees... and there are NONE flying around the holes, or siding any more! 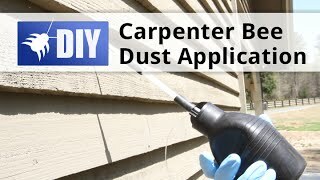 DELTA DUST IS A MUST for carpenter bees. It worked GREAT!!!! We have ordered Delta Dust in the past to control Brown Recluse Spiders. It is amazing! We had our house sprayed for several years, twice a year, and we would still have Brown Recluse Spiders. I found your website and ordered Delta Dust from you, and our Brown Recluse Problem has been cut in half. We continue to apply the Delta Dust and see great results. Thank You!! P.S. We use it as a perimeter treatment and also in wall voids, in the attic space and under the house. I am very thankful for your product as we were killing approximately 5 spiders a week before we used the Delta Dust. I still find them now and then, especially when the dust has been washed away outside. This stuff saved my sanity and my marriage! My husband picked up bed bugs in a four star hotel while away for work in the UK. We know that's where he got them because he'd seen one inside his suitcase the day he returned and he was asking me if I knew what it was. I didn't and we just thought it was "a bug" not realizing that a within a week we'd both be covered all over our abdomens and arms with the nasty bed beg bites. We vacuumed, cleaned, tossed bedding, dry cleaned etc but they kept coming back. Until I did my research and discovered Drione dust. Follow the instructions to a T and you'll succeed in eradicating those evil, disgusting pests. We also did the "Vasoline" around the feet of our bed which helps keep them from climbing up the bed from other areas of the home. It was HELL. HELL!! But we beat them. We also bought the air tight mattress and box spring protectors. They work! It's all good, it all helps. Good luck! I use a hand duster to puff Delta Dust into wall voids by inserting the duster underneath my baseboards. It will kill whatever is living inside the walls or travelling along the perimeters of the room. Also used Suspend SC (liquid version of Deltamethrin) with a gallon sprayer on top of the dust for an added punch-- this duo of Delta Dust and Suspend SC has given me great results in getting rid of earwigs, spiders, ants, and fleas. Used it for yellow jackets, seems to have done the job. It took a couple of days, but they are gone. 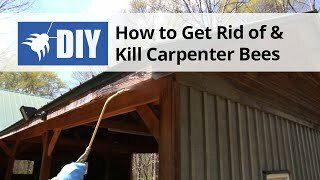 Does Delta Dust kill carpenter bees immediately? Does Delta Dust kill carpenter bees immediately? I drenched two of them today and they both flew off. One was boring a nest and the other was actually in a nest. I believe one actually survived and came back to its nest. Thanks. Delta Dust will not kill on contact. In fact, no product will kill a bee or other insect immediately other than Wasp Freeze or a pyrethrin aerosol. The bees that you covered with Delta Dust will die, but not until the bees ingest the dust. When bees walk through a hole or land on a surface that you dusted, they pick up the dust on their bodies. Later, when they groom themselves as most insects do, they will ingest the small dust particles and die soon after. All dust products work better the less you apply. You should only apply a very thin light dusting of the material. Bees and other insects have thousands of microscopic hairs on their bodies and will pick up the dust quite easily. A pile of dust in one place will look like a mountain to a small insect and they will walk around it instead of through it. What is the difference between Delta dust and Drione dust? I want to kill brown recluse spiders. Which one do you think would be better? The main difference in these two products are the active ingredients. Delta dust contains the synthetic pyrethoid deltamethrin while Drione dust contains the natural ingredient pyrethrins. Both will do a fantastic job eliminating almost any insect including spiders, though you should note that dust insecticides can take several days to actually kill the insect. Delta dust does have one advantage over Drione dust, Delta dust is the only waterproof dust on the market and it will still be effective even if it gets wet. Is Delta Dust safe for having pets in the house such as parrots? 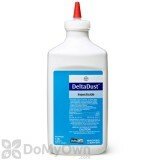 Yes, Delta Dust is very safe to use indoors around pets and children. You should keep children and pets out of the room while you are applying the product, and then it is ok to allow them to come back in once you are done. Of course, you want to use common sense and not dust out in the open or inside the parrots cage, but if you apply Delta Dust into the areas specified on the product label, (cracks and crevices, under appliances, and inside wall voids) there should be no issues. How quickly does the Delta dust kill spiders? I have brown recluses I have dusted under furniture and behind appliances. How quickly the Delta dust will kill a spider is dependant on how much dust the spider picks up on its body and the size of the spider. Typically dust can kill a spider in as little as an hour or as long as 24 hours or more depending on these factors. I had Delta Dust puffed into my attic, how safe is it, and can I go into the attic? 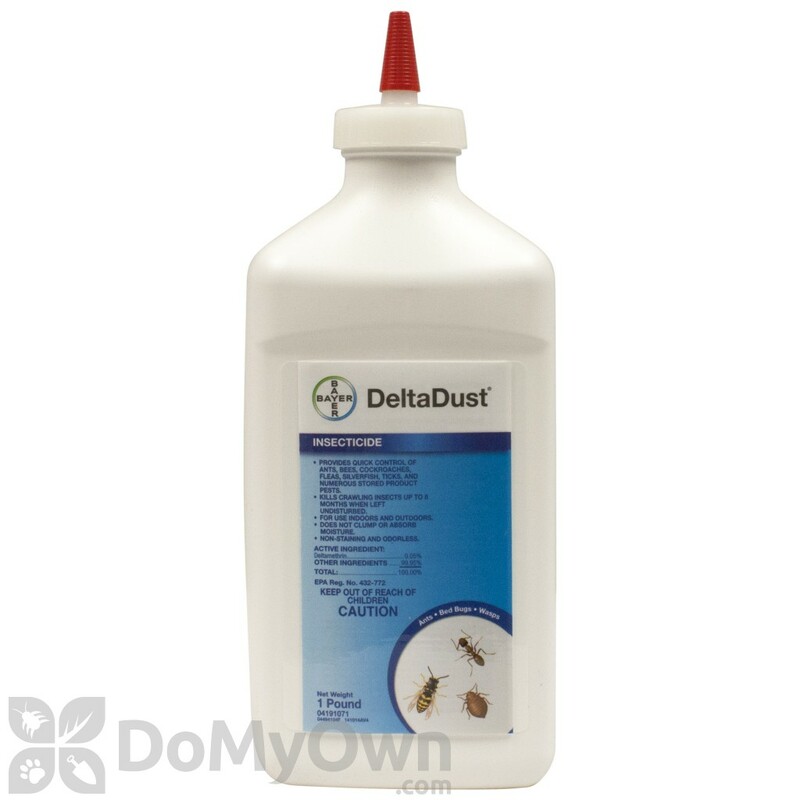 Delta Dust is a very safe product and only strong enough to kill small insects. If the Delta Dust has already been applied and settled, it should be perfectly safe to re-enter the attic space.